My friend Steve and I, spent the New Year Eve together. Both of us love good food, and we enjoy cooking together.We made this very elegant and rather romantic dinner together. This dish had a light cheesy tomato taste, and not at all heavy or rich.. Was perfect with the rice pilaf, but i could also see this paired with any kind of pasta. The sauce would be delicious over cheese ravioli.We drank Korbel Champagne, the flavor blended nicely with the dish. Would give this recipe 4 stars. A real great recipe, one you should really try for your self. Season chicken, if desired, with salt and pepper. Heat Olive Oil in 12-inch nonstick skillet over medium-high heat and brown chicken, about 5 minutes. Remove chicken and set aside. 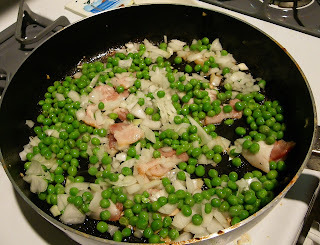 Cook onion, bacon and peas in same skillet, stirring occasionally, 6 minutes or until bacon is crisp and onion is tender. Stir in wine and cook 1 minute. Stir in Sauce. Bring to a boil over high heat. Reduce heat to low, then return chicken to skillet. Simmer covered 5 minutes or until chicken is thoroughly cooked. Sprinkle, if desired, with freshly ground black pepper and chopped fresh parsley. 6 minutes or until bacon is crisp and onion is tender. Stir in wine and cook 1 minute. Stir in Sauce. Bring to a boil over high heat. 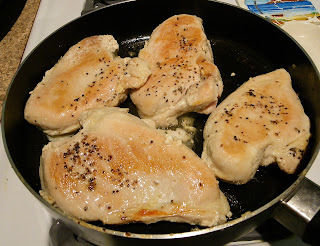 Reduce heat to low, then return chicken to skillet. Simmer covered 5 minutes or until chicken is thoroughly cooked. Sprinkle, if desired, with freshly ground black pepper and chopped fresh parsley. What a great way to jazz up chicken! Thank you for linking up to Simple Supper Tuesday. Hope to see you next week! 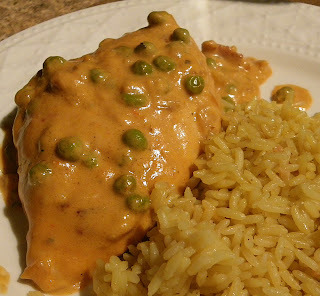 So comforting, easy and delicious! This must go great with some good wine! I would love this recipe if it could be made vegetarian! 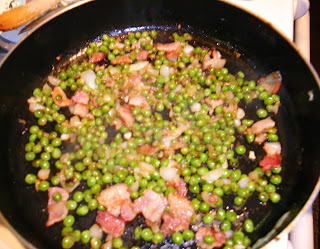 Loved this dish before I became vegan. It looks so yummy! I like the pictures that shows the steps to prepare it and the explaination is very clear :) I want to try to make it too! I will share this with my wife...she's always looking for different ways to cook chicken. Great details and pics!